Fri., March 10, 2017, 11:03 p.m.
NASHVILLE, Tenn. – After recently struggling to start or sometimes finish games effectively, No. 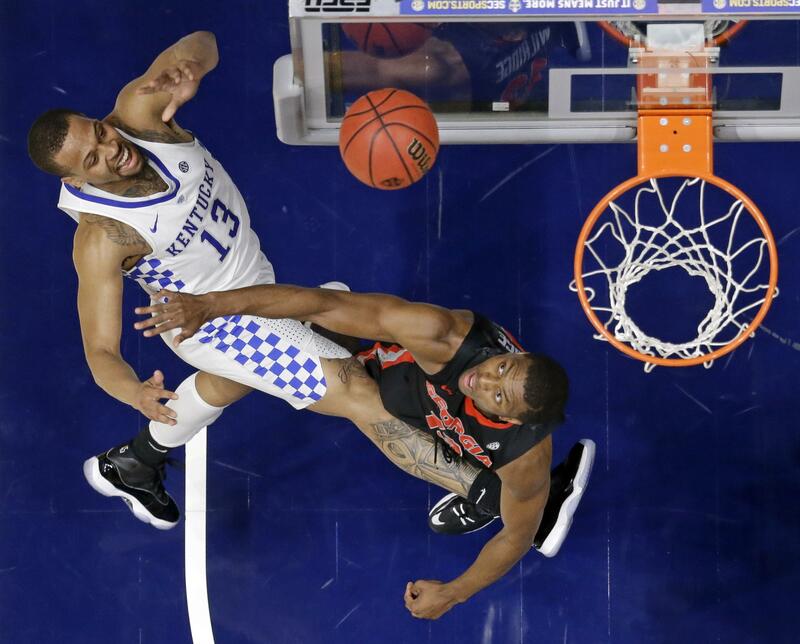 8 Kentucky opened tournament play by taking control and maintaining it against one of its toughest foes. Isaiah Briscoe and De’Aaron Fox each scored 20 points, Bam Adebayo added 13 and the Wildcats led Georgia throughout for a 71-60 victory on Friday in the quarterfinals of the Southeastern Conference Tournament. Coming off a double bye as the No. 1 seed, the well-rested Wildcats started both halves quickly and steadily pulled away for a double-digit win over the Bulldogs after two close victories against them. Kentucky (27-5) offset 38 percent shooting by holding Georgia to 19 of 57 from the field (33 percent) and leading by as many as 18. Briscoe provided the biggest lift, making 8 of 15 for his highest output since scoring a season-high 23 against Georgia on Jan. 31. Fox contended with foul trouble but made 7 of 12 while Adebayo grabbed 10 rebounds to help Kentucky advance to Saturday’s semifinal against Alabama. Derek Willis grabbed a team-high 11 boards and scored seven points before fouling out. Kentucky scored 18 points off 13 Georgia turnovers, getting several critical baskets off mistakes at the beginning of both halves. “It was the defense, the fight, that won the game for us,” coach John Calipari said. J.J. Frazier had 15 points and Yante Maten added 12 for the eighth-seeded Bulldogs (19-14), who played their second tournament game in as many days. But Georgia’s top two scorers combined to make just 7 of 28 from the field, with Frazier missing all three attempts from behind the arc. Georgia: The Bulldogs faced a big hurdle with a quick turnaround and couldn’t get the offense they needed against the fresher Wildcats. They made some 3-pointers in the second half, but they came too late to do any damage against a deficit that reached 18 with about 10 minutes remaining. Rebounding was the only consolation (42-all), with Derek Ogbeide’s 15 boards matching a career high before he fouled out late. Kentucky: Snapping out of their recent habit of slow starts certainly helped the Wildcats, who built a double-digit lead within 12 minutes and kept a comfortable cushion. They did this despite another rough outing for leading scorer Malik Monk, who scored just two points in 26 minutes after totaling six at Texas A&M. Kentucky: At this point, the Wildcats are more focused on NCAA Tournament seeding than their ranking , though taking a step toward moving up the Top 10 certainly helps their prospects. As Georgia awaits its postseason fate, Calipari reiterated his point that the Bulldogs belong in the NCAA Tournament field. Georgia coach Mark Fox agreed and insisted that his team’s performance against a tough schedule merits consideration. Georgia: Postseason status to be determined. Kentucky: Faces Alabama, a 64-53 winner over South Carolina, in Saturday’s semifinals. Published: March 10, 2017, 11:03 p.m.